First I want to say Arrow Video is one of the finest companies of high quality Special Edition Blu-ray’s and DVD’s. They are a company that seems to always amaze me in the high end products they put out. Not only capturing the films in a whole new outlet, but also supplying a wide range of cinema, and, a one of a kind production of Special Features. Arrow Video is one of my 10 favorite Blu-ray and DVD companies out there. I was super happy to be able to review this new release. Bloodbath is a Drive-in, late night, B-movie glory that shines in all it’s over the top wonderment of horror, blood and 60’s nostalgia. Now here is where it gets weird. There are four versions of this film, and amazingly Arrow Video has put all four versions on this 2 Disc release, that is just bloody brilliant in so many ways. I watched all four versions, it was great seeing the many changes and different ideas put into creating it during its twisted production reality. So basically you’re getting four movies all with different plots and changes. The plot is very simple and yet unique in many ways considering all the changes to the original idea of the film. So you have an artist named Antonio Sordi. Sordi has vampiric ideas and lust, and basically kills women, and after words puts their body in hot wax in his studio. Now the original movie was supposed to be a spy thriller financed by B-movie guru and master, Roger Corman. Believe it or not Corman did not like the final movie and so bits and pieces where added and taken over a period of time, giving forth to four different versions of the final product. You have two directors Jack Jill and Stephanie Rothman at two different times editing and piecing together to complete their versions. Both have credit for directing the movie. Besides Corman’s vision, Jill’s vision and Rothman’s vision, the fourth version is a TV produced version, taking away and adding different plot sections. So you can see the mess this movie went through to be made. This is a cheesy, classic, drive-in late night, Ghoul hosted wonderment of everything that is brilliant and perfect about cheesy B-movies. I loved this film being able to see all the versions and was just a spectacular example of the high quality of the Blu-ray that Arrow Video put out. So not only do you get to see Bloodbath complete, you get to see Operation Titian, Portrait in Terror, and Track of the Vampire, all the same movie but with different plot elements. Starring a cast of wonders. The amazing William Campbell. Campbell was truly a brilliant performer. He starred in two of my favorite films 1963’s Dementia 13 and 1964’s Hush Hush Sweet Charlotte. From TV to film he always maintained his characters in great detail. A little trivia about Campbell is he appeared in the episode of the original Star Trek The Trouble with Tribbles as the character Koloth, in 1967, reprises that same role in Star Trek Deep Space Nine episode Blood Oath in 1994. He was wonderful as always in Blood Bath. Also starring the very beautiful Lori Sanders. Sanders is probably best known for her TV work, her character of Bobbie Jo Bradley in Green Acres, Petticoat Junction and The Beverly Hillbillies. Also starring the amazing Biff Elliot and the one and only horror/sci-fi/cult icon Sid Haig. Now the two directors involved in piecing this film to completion really needs no introduction. The one of a kind master of Cult Films Jack Hill. Hill has created some of the greatest icons in film from the Blaxploitation films of Coffy, Foxy Brown to the black and white cult classic Spider Baby. Not only a director but writer and producer, editor, cinematographer, and just about everything in the movie making world. Hill is an icon of Drive-In late night cinema. He has created some of the best low budget, B-movie flare to ever grace the cinema world. Next up is Stephanie Rothman who also created low budget, drive-in fodder. She like Hill knew how to create odd films that linger and last in the imagination of B-movie exploitation fans. Again I can’t speak highly enough about this high quality Blu-ray by Arrow Video. They truly know how to create and showcase forgotten cinema in a whole new way. This is brilliantly brought to life in High Definition. Crisp, clean, audio. Beautiful imagery. One thing Arrow Video has never let me down is the new transfer in video quality. The High Definition is spot on with this Blu-ray. It has never looked any better. Arrow Video mastered this reality. The audio and video is priceless with this release. Arrow Video never fails in bringing out high end products. 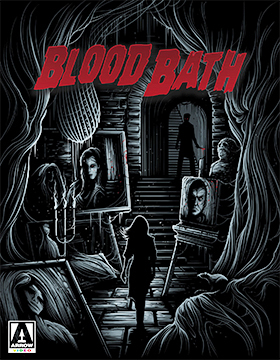 Blood Bath is a great B-movie trip back to the 60’s, when Drive-In, late night, cheesy cinema was all the hype. This is in my viewpoint a must own product. Arrow Video did it again. Highly Recommended.